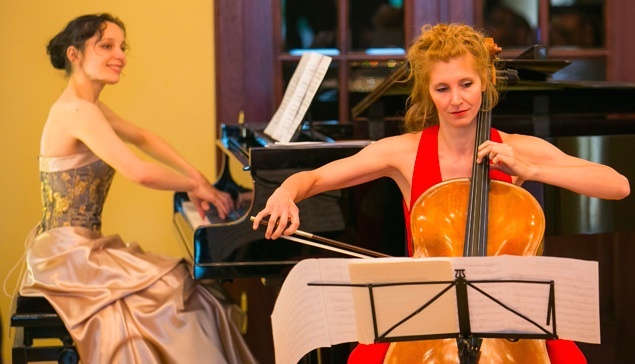 Hungarian cellist Ágnes Kállay and Latvian pianist Diana Zandberga started collaboration in 2013. The repertoire of this international duo covers a wide range of musical styles, from baroque through classical to contemporary music; moreover, they are devoted to works of Latvian and Hungarian composers. Among significant performances were concerts organized by Latvian Embassy in Budapest (2013); concert tours in Latvia and Hungary dedicated to the Latvian presidency of the Council of the European Union (2015), recital in Budapest Music Center, where duo was invited by the Central Bank of Hungary etc. Ágnes Kállay graduated at the Franz Liszt Academy of Music, Budapest in 2006. In the following year she earned DAAD scholarship and moved to Cologne (Germany) to study under Maria Kliegel at the Hochschule für Musik. In 2008 she continued her studies with Nick Tzavaras and the Shanghai Quartet at Montclair State University (USA). In 2013 she completed her doctoral studies with Colin Carr at Stony Brook University (USA). In 2004 she won the Alpe Adria International Violoncello Competition in Gorizia, Italy. In the same year they were chosen among the best ten duos with pianist Katalin Csillagh in the Maria Canals International Chamber Music Competition in Barcelona, Spain. In 2007 their duo was placed first at the Beethoven Chamber Music Competition in London, UK. In 2010 Agnes was selected among the best 13 cellist at the 5th Unisa International String competition in South Africa. In 2010, 2011 and 2012 she three times won the Ackerman Chamber Music prize at Stony Brook University. She participated in the master classes of Ralph Kirshbaum, Tsuyoshi Tsutsumi, Philippe Muller, Guido Schiefen, Alberto Portugheis, Martin Lovett, Déri György, Gulyás Márta, Ida Kavafian, Leon Fleisher, Pieter Wispelwey, Joel Krosnick and Emanuel Ax. In 2010 she was invited to the Tanglewood Summer Music Festival, where she had the chance to work with Steven Ansell, Norman Fischer, Rafael Frühbeck de Burgos, Michael Tilson Thomas, Herbert Blomstedt, Stefan Asbury, Robert Spano and John Williams. In 2011 she was qualified for the final round with her flute trio at Coleman Chamber Music Competition, in Los Angeles. In 2013 with her piano trio, Trio Artica, she received Special Recognition at Plowman Chamber Music Competition in Columbia, Missouri. As a baroque cellist, she performs with Camerata Hungarica, Mandel Quartet, Excanto and Marquise early music ensembles. Agnes currently teaches at Bartok Bela Conservatory and at Szeged University of Music, and she is an external teacher at Liszt Ferenc Academy of Music. She has annually given master classes at the Danube Concerto Masterclass in Budapest, Renaissance and Baroque Week in Gyor, Hungary, and at the Dolomiti Chamber Music camp in San Gregorio, Italy. Having obtained a master’s degree at the Jāzeps Vītols Latvian Academy of Music with Prof. Juris Kalnciems, in 2014 Diana Zandberga completed her studies for PhD with Prof. Dr. art. Jeļena Ļebedeva and Prof. Dr. art. Sergejs Osokins (thesis title: Historical and Stylistic Development of Piano Texture and its Manifestation in Latvian Music). Between 2000 and 2004, she studied with the legendary pianist Lazar Berman at the European Academy of Music in Erba Italy, and for the next four years she improved her performance with the world famous Spanish pianist Alicia de Larrocha at the Granados Marshall Academy in Barcelona. Since 1996 Diana Zandberga has won acclaim for a succession of recitals in Latvia, European countries, Russia and USA as well as attending musicological conferences in Latvia, Lithuania, Netherlands, Poland and Russia. She has performed with Shoumen Symphony Orchestra (Bulgaria), Orquestra simfónica del Vallés (conductor Uwe Mund) in Palau de la Musica Catalana (Barcelona), Orchestra Filarmonica di Bacau (Romania) with Francesco Attardi in Milan Teatro dal Verme in a prestigious concert cycle Serate Musicali, Saint-Petersburg State Symphony Orchestra KLASSIKA (Maestro Alexander Kantorov) etc. Her discography includes the following CD’s: Transcriptions (2003), Dreams of Spain (2011), Dedication to Bicentenary of Ferenc Liszt (2012), Landscapes of Hungarian and Latvian Piano Music (2013) and album of piano music by Dace Aperāne Sounds and Echoes (2015) released by Latvian National Record Label SKANI. Since 2015 Diana Zandberga is a member of the Instrument Performance Teaching Department and of the Piano Department at the Jāzeps Vītols Latvian Academy of Music and a board member of the Latvian Piano Teachers Association.